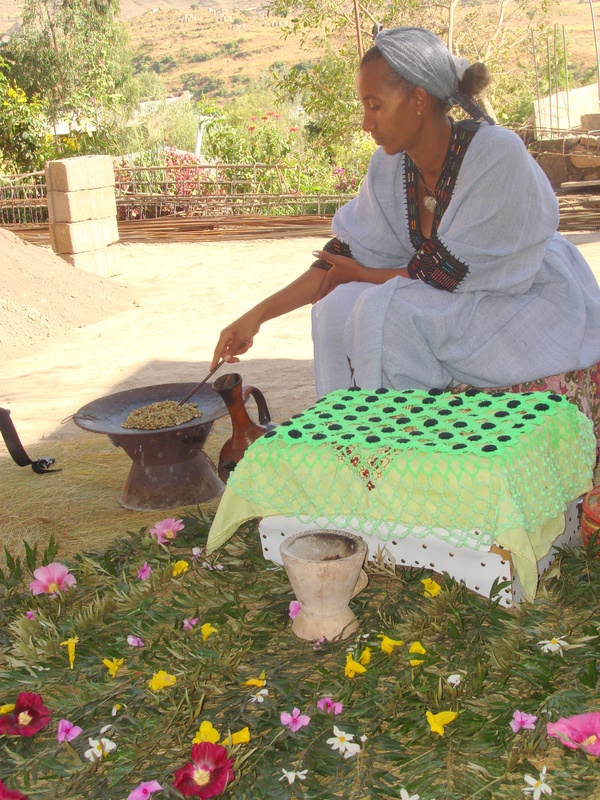 When we visited a private home in Ethiopia, we never expected a coffee ceremony in the country where coffee originated. 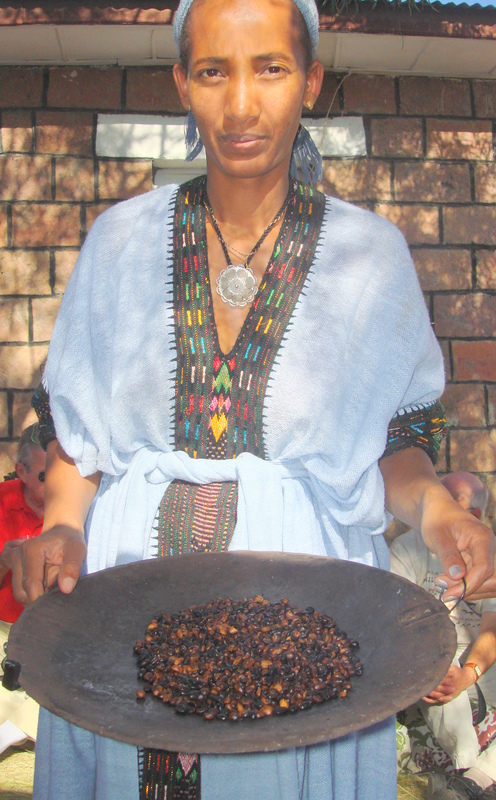 The coffee ceremony always includes friends and neighbors and is held daily in Ethiopian homes to celebrate the glorious cup of coffee. Tradition says they must never drink coffee alone. The ceremony was held in a eight-foot oval, green grass area containing a foot-tall chest-of-drawers for coffee cups, cream, sugar, spoons, napkins and all things needed to serve coffee. On top of the grass were flowers, a black coffee pot and a wok-like skillet, all on a charcoal fire. 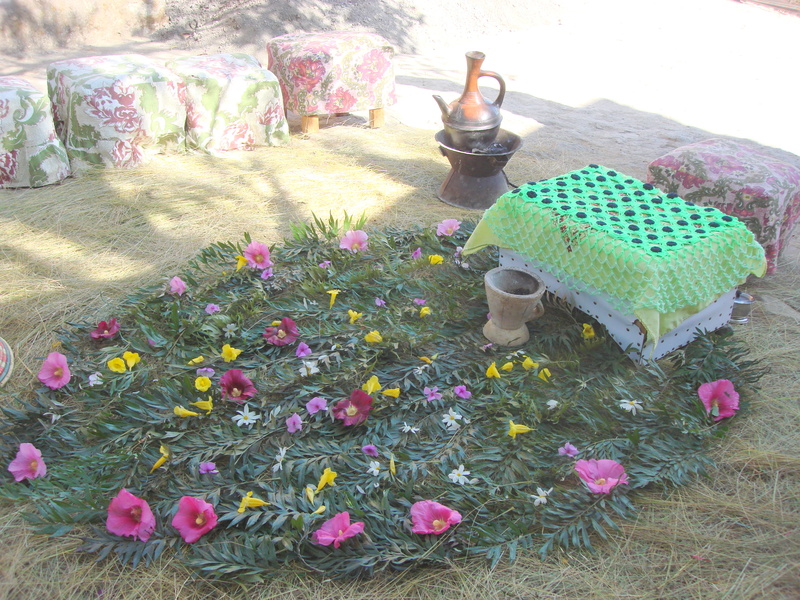 Nearby, an incense burner emitted smoke full-blast, a vital part of the ceremony. 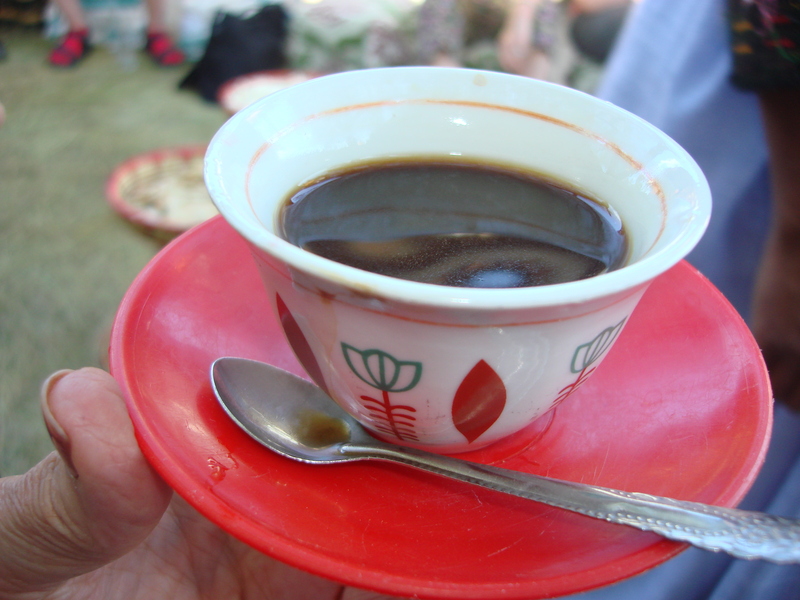 The smell of coffee filled the air as the hostess roasted a cup of coffee beans in seed-oil on the fire. 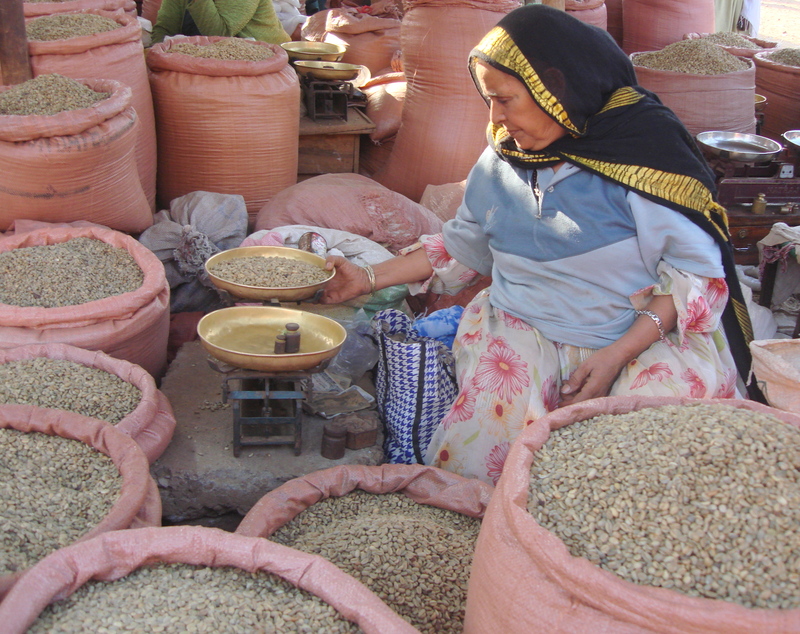 She tossed and stirred the Ethiopian coffee beans 10 to 15 minutes until they were ready for grinding. But before the grinding occurred, the hostess allowed each guest to smell the roasted beans to make sure they were ready for coffee. All approved, so the bean grinding began. 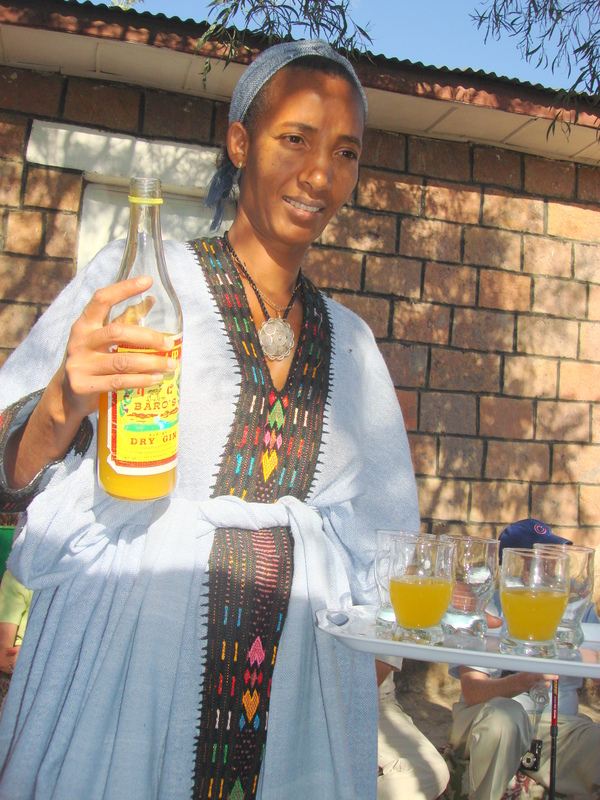 During this process, we had to sample Araji, home-made vodka-like liquor from barley, Oteh, home-made honey liquor with orange juice, and Kita, a popcorn snack. Then, the hostess placed the beans in a mortar and mashed them with a pestle over and over until they were ground. Next, she placed the grounds in the thin, tall neck of a black coffee pot full of boiling hot water and pushed the grounds into the pot. Now, the coffee was ready to serve. 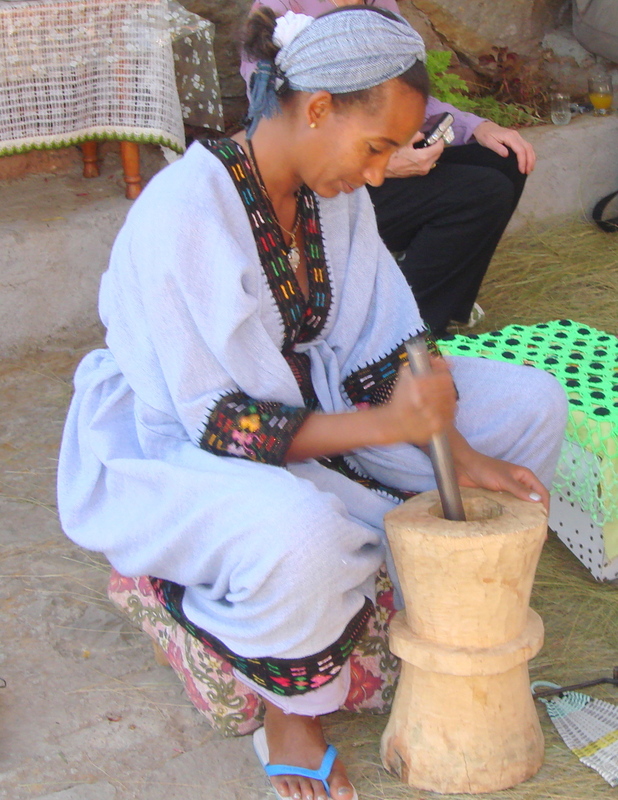 Then the hostess told us of an Ethiopian tradition that her husband must be pleased with her brew. If he is not, she must brew another pot from scratch. As we left, the tourists on our Abercrombie & Kent and Kibran tours had many thoughts on that tradition. But the coffee was delicious and she didn’t have to do it all over again. It had a hint of cinnamon in it and was perfect. We left wanting more than one cup it was so delicious.